In her fifth Guest Editor post, Wangūi Kamonji takes us to the Lake Victoria Peace and Sustainability Centre. Hapi nie lwet wadu – your luck is in someone else’s hands. Members of the Lake Victoria Peace and Sustainability Centre (LVPSC), a network of organisations based on Rusinga Island, Western Kenya, shared this Dholuo proverb with me. The network embodies this proverb, which emphasises the importance of relationships by pointing out that good things meant for you come through others, and not always directly to you. LVPSC brings together about 30 groups and organisations working in various sectors on the island under the banner of peacebuilding and sustainability work. 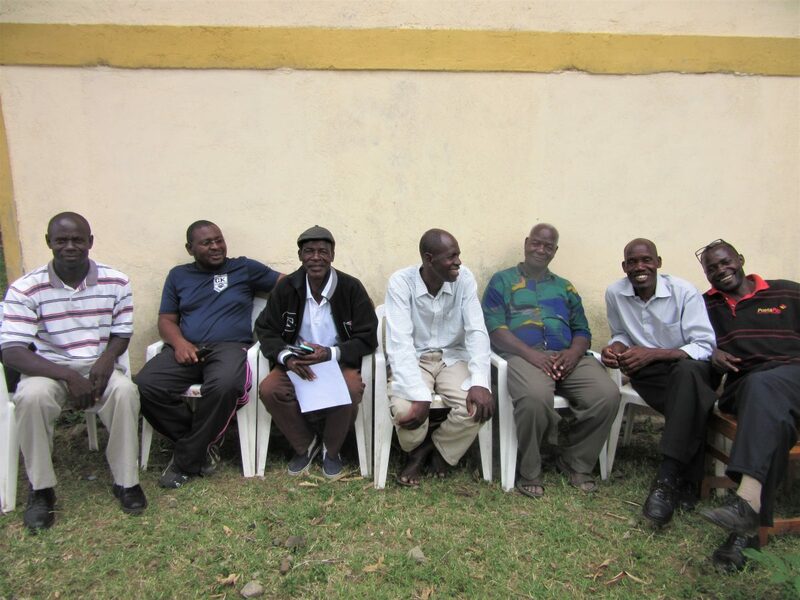 Through working together they are able to support smaller groups, have access to peacebuilding and ecological trainings, and widen their reach both on the island and in wider Kenya. All of this contributes to their overall goal of building peace on the island and ensuring the island’s ecology and activities are sustained. LVPSC Members at a meeting. Why a network and not a group, I asked Solomon Owiti, founder of LVPSC. 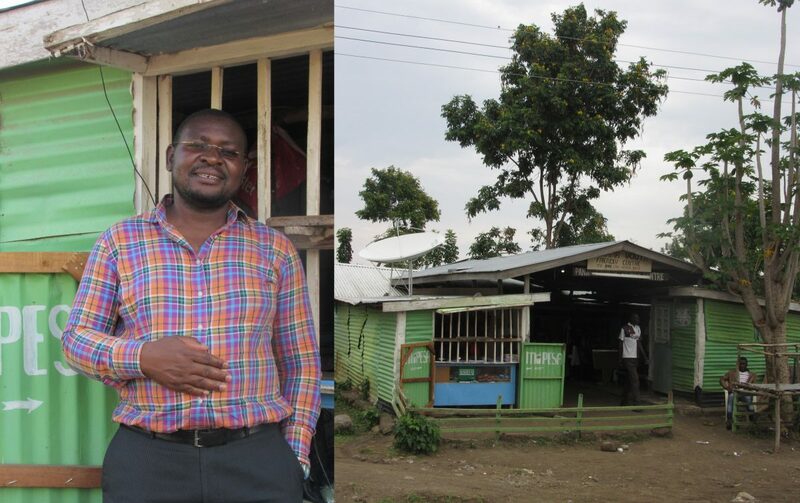 He asked himself, “How can I reach more people?” and realised that rather than starting an organisation himself, forming a network to bring all the organisations working on Rusinga Island together under a banner of peace, and sustainability was the way to go. The network provides an opportunity for groups to learn from each other. Within the network are groups working on environment, HIV/AIDS, children and youth work, women’s and gender issues, persons living with disabilities, the Luo council of elders, and government representatives as advisors. Morris Ogolla of Integrated Community Development Initiative (ICODI) learnt permaculture through Badilisha Ecovillage, another LVPSC member group. LVPSC also provides opportunities for representatives of member groups to attend training sessions facilitated by persons outside the network. Through this avenue, all members have been introduced to Non-Violent Communication (NVC), which helps them run their organisations well, manage conflict, and therefore achieve their peacebuilding goals. Learning from each other doesn’t only happen in formal training sessions however. Samuel Jaoko, who represents Lord of Mercy, a group for people living with disabilities, has felt braver to go out and seek work through being a member of LVPSC, and has passed on this encouragement to other group members. Through interacting with Joshua Ogolla, co-founder of PANAMA youth group, Morris has begun to think about how to include more youth programming in his work with ICODI such as having youth gardens and hosting youth discussions. LVPSC provides members with the opportunity to teach and share what they know as well. Peter Otieno heads the Small Island Child Aid Network (SICAN), a group whose work involves advocacy and rescues of vulnerable children. Through being an LVPSC member and sharing his organisation’s work, other LVPSC groups have become more sensitive towards the challenges faced by orphans and vulnerable children on the island and are tailoring their programmes accordingly. He adds that through working with the network’s other member groups, SICAN has reached more people on the island. Politics came up a few times in my conversations with different LVPSC members. Peter told me that he asked himself what example he would be giving his children were they to see him voting for politicians whose actions were contrary to the values he believed in. This was during a time when it seemed like the island was experiencing violence everywhere: there was a stand-off between Kenya and Uganda over ownership of another island in Lake Victoria, conflict within families spilt over into the public sphere, and students burnt a high school dormitory down. Trying to understand this wave of events, Peter concluded that dialogue would be one solution in the situation. LVPSC was an avenue to learn better dialogue skills. But violence is also structural. During a people’s protest over electricity delivery on Rusinga Island, a government official remarked, “They are standing outside complaining, and we are seated inside eating.” As though to say that the protests had no impact on his actions and comfort. This showed Solomon the wealth disparities on the island, disparities that are replicated in the country. Wealth and power disparities like these are experienced at the individual and family level. At the time he started LVPSC, Solomon was disturbed by a rise in incidents of family members arguing to the point of injuring each other. “This is strange,” he felt, pointing to how community values that had previously held society together are disintegrating under today’s pressures. The involvement of the Council of Elders in LVPSC as advisors was a choice driven by the motive of restoring the traditional role of elders as harmony maintainers in community. The comment during the protest also brought home for Solomon the link between having basic necessities and opportunities, and violence. Coupled with restoring the role of elders, Solomon adds, “There will be no peace if there’s no peace in your stomach.” This is where sustainability comes in. Walking through Badilisha Permaculture site. How could Rusinga Island dwellers sustain themselves and do this in a way that was not overly reliant on outside help? Jaoko echoes a similar sentiment. The lives of people living with disabilities have numerous challenges, which only get amplified during times of conflict. 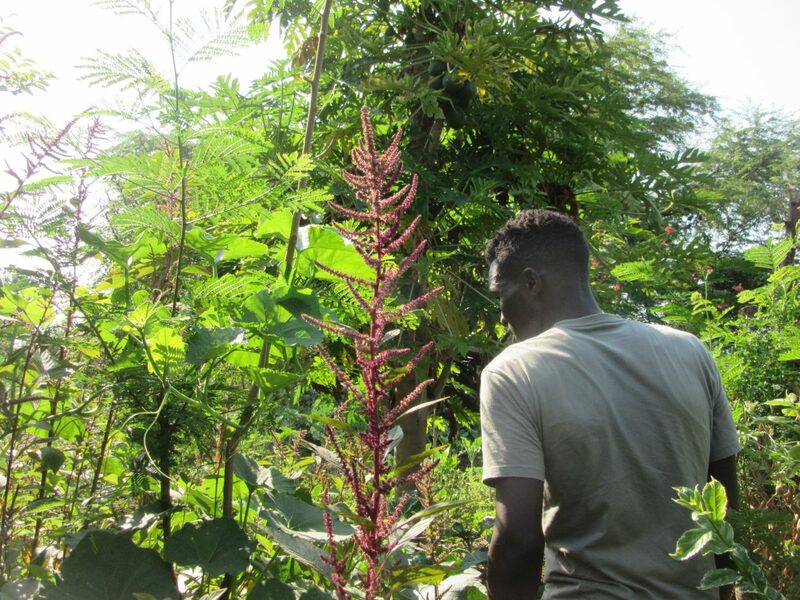 Through LVPSC, members have gained the confidence that they can solve some of the challenges facing them, he says, through for example having permaculture gardens that supply or supplement members’ food. Solomon walked me round his permaculture garden where the pawpaws were due to be ripening soon. For him sustainability also means the freedom to think about peace, a freedom evident from the plenty on his farm. 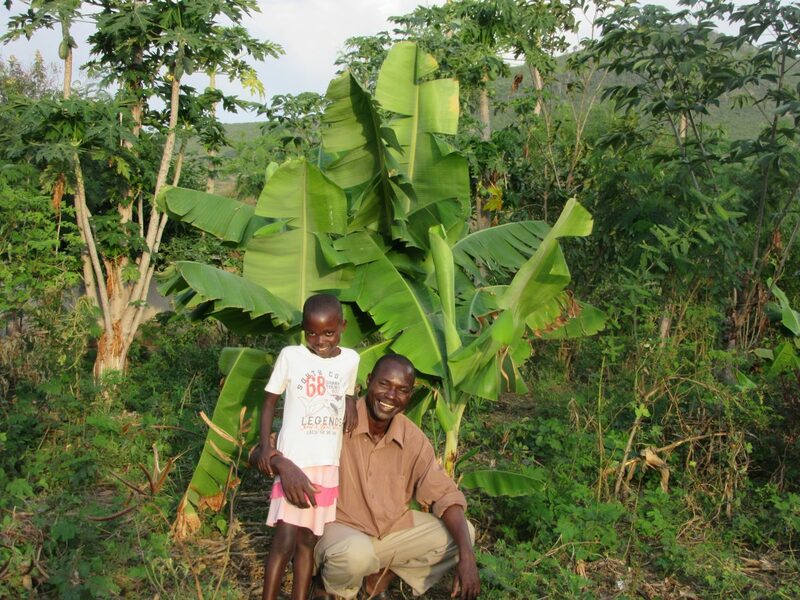 Solomon, LVPSC founder and his daughter at his farm – bananas, pawpaw, mangoes and other plants abound, which means he and his family will have food. Badilisha Ecovillage has also been supplying tree seedlings for free and encouraging tree planting. Through the ‘Fruits for Schools’ programme, schools were given fruit tree seedlings to supplement food and nutrition for students who were not able to get breakfast at home. It’s a programme for the long haul and has been replicated at a hospital on the island and at the homes of community members where at least one pawpaw tree was always present. A core livelihood of Rusinga Island dwellers is fishing. Currently one fishing association and one beach management unit are part of the LVPSC. Both of these have enable other LVPSC members become more conversant with the challenges faced by fishers. Working with local volunteers on each beach, the LVPSC helps ensure records of fishers are kept for accountability purposes and brings fishers together for peace talks in an effort to reduce conflict over the best fishing spaces in the lake and to enable fishers’ associations address their challenges. 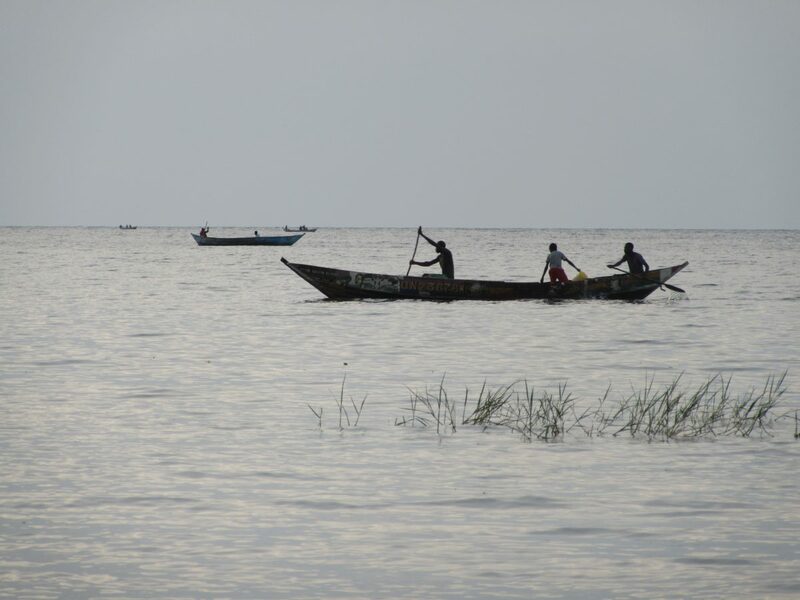 Cross-learning from groups such as Badilisha within the network would also help fishers diversify their livelihoods and enhance their sustainability. The network is not without its challenges, however. Some member groups inevitably do not participate as actively as others. Some might appear to have joined the network as an opportunity to access material resources, which are few. Smaller organisations that had not been very active prior to joining LVPSC have not been able to take advantage of the opportunities presented due to their internal organisational challenges. But LVPSC is determined to keep all members in the network. “Peace cannot be full without unity. And unity cannot be full without many people,” Morris says, “We will strengthen [the weaker members].” Solomon also wishes there was a common space that LVPSC members could use. This is part of his vision for the future of LVPSC. It would allow a stronger presence and reach for the network and a space for members to host events and trainings in. All this with time. Knowledge sharing, encouraging each other, influencing each other and therefore more Rusinga residents, restoring harmony through dialogue and cultural mediators, ensuring access to necessities and opportunities, and amplifying the voices from a small island “in the farthest end of Kenya” – all of this, the Lake Victoria Peace and Sustainability Centre aims to do. It is a big task, and so they chose, wisely I think, to go together.